The Fujitsu Fi-6130 Document Scanner Features: Paper size: A4 Input: Colour, greyscale, black and white Scanning Speed: 40 (80 images per minute) Automatic Document Feeder: 50 Sheets Interface: USB A4 Flatbed: Yes Drivers: TWAIN, ISIS Compatibility: Windows Vista and XP Free software: Adobe Acrobat 8 Standard, Kofax VRS Professional and ScandAll Pro The Fujitsu fi-6130 Document Scanner offers high quality output resolution up to 1200dpi. interpolated or 600dpi optical. Control over error diffusion, colour dropout and gamma correction via the driver allows a wide variety of documents to be scanned. The user selectable black/white background enables the use of document deskew and autocropping of mixed document and high quality scanning of thin documents. Small businesses and distributed scanning applications are the ideal market for this sheet fed, full 24 bit colour, duplex scanner. The Fujitsu fi-6130c Document Scanner has a recommended daily duty cycle of up to 2000 A4 documents per day and the ability to scan at 40ppm / 80 ipm in mono or 30ipm / 60 ipm in full 24 bit colour. Improved Feeding Capability The Fujitsu Fi-6130 Document Scanner incorporates a new feeding mechanism based on its highly respected sibling, the fi-5900C. Based on brake roller technology rather than a pad, this provides much more reliable and controllable feeding of a wide range of papers and other media. Advanced Imaging features The Fujitsu Fi-6130 incorporates the latest imaging technology to allow multi streaming, page splitting, punched hole removal and advanced cropping. Software The Fujitsu fi-6130 is supplied with VRS 4.2 Professional, it simplifies the scanning process, ensuring the best quality image in a single pass without the need to manually adjust Scanner setting. VRS Pro will also auto rotate documents based on content - cutting down paper preparation time. Also included is ScandAll Pro scanning application, which can simplify batch scanning operations to a single button press on the scanner. Additional features With a fold away output tray the scanner can be positioned near the users workstation for ease of use. When not in use the scanner reverts to a sleep mode using only 6.2 watts of power. 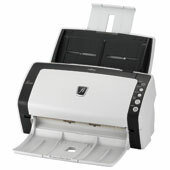 Interface The Fujitsu fi-6130 Document Scanner has an industry standard USB 2.0 interface Options The Fujitsu fi-6130 Document Scanner can accept a post imprinter unit to stamp the back of each scanned document with up to 40 characters serving as further proof that all documents have been scanned.